The Condominium Management Companies Association (CMCA), a nationwide industry group, announced recently, the results of a survey showing that 80% of homeowners’ associations (HoA) ban minpaku operations completely. Only 0.3% of HoA’s surveyed reported that they will allow minpaku operations. The announcement highlights the disparity between the scheduled June 15th, 2018 deregulation allowing minpaku operations nationwide versus the HoA desire to protect their private property rights by outlawing the practice completely. 308 of the 365 member organizations of the CMCA, or approximately 84.4%, responded to the association’s survey regarding their plans for allowing or prohibiting minpaku. 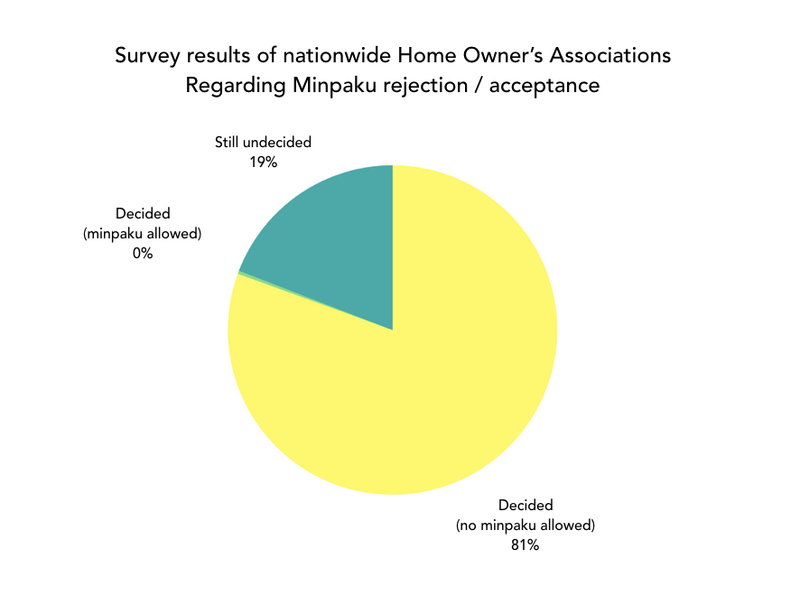 80.5% of respondents reported they are introducing outright bans on minpaku, with only 0.3% saying they will allow the practice. 19.1% were still deliberating, indicating that the number of condominiums prohibiting minpaku may increase further. CMCA estimates a total of approximately 6,335,000 condominium complexes across the country as of 2016, of which over 92% outsource management to one of their member organizations. “People choose to live in condos as their primary residence and wish to live in peace” commented a spokesperson for CMCA as a possible reason for the majority of condominiums outlawing home-sharing. Recent years have seen an increasing number of complaints of minpaku tenants disrupting the lifestyles of nearby residents by making loud noises during quiet hours and disregarding local rules for practices such as garbage disposal. Municipalities are introducing strict curbs on such operations in response to the proliferation of illegal letting. Following the June 2016 passage of the Housing Accommodation Business Law, the Ministry of Land, Infrastructure, Transport and Tourism notified real estate industry groups in August that it would clarify management regulations in cases where condominiums choose to ban minpaku. Language concerning the permissibility of the practice has since been added to the Ministry’s management charter template, used by over 80% of condominiums in the country. The environment surrounding the Housing Accommodation Business law, which was originally hailed as a nationwide lifting of the ban on minpaku, has become very strict and it is unknown whether the number of filings will increase.